RV camping is a pleasurable activity, but the fun aspect can be improved with the best TV for RV. But then, we understand how hard that is to choose a unit that suits your needs well if you don’t know what to look for. For this reason, we’ve come up with a guide listing the things to consider when buying an RV TV. Later here as well, we’ve shared how we picked from the different recreational vehicle television packages available on the market. 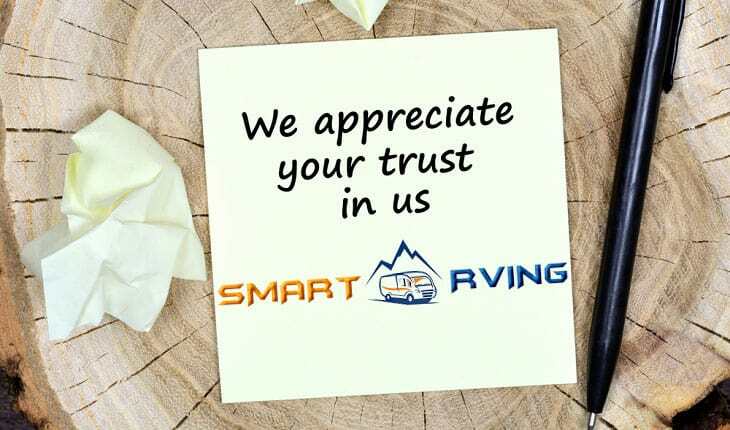 So if you’re ready, let’s begin and review the best RV television sets as well as the factors to consider when comparing your options. Entertainment on board is what we want whenever we go traveling with our recreational vehicle. In addition to the sights and sounds of the surroundings, we also appreciate watching our favorite shows and keeping our children entertained with their favorite cartoon shows. That is why I love this Sceptre E246BD-SMQK. I believe that it is the best TV for travel trailers because it is sleek and has a great picture quality. It is one of the best recreational vehicle or camper TVs that can provide the entire family with fun and entertainment while traveling. Another thing I love about it is that it is a combination of a television and a DVD player. That’s awesome I think. So when it comes to entertainment, we have some options for choosing this TV. I also recommend it because of its HDMI output feature, which can provide us with great digital videos and sound. It also connects to the television with just one cable. I also like that it has a DVD player, so I don’t have to buy a separate one because this model already comes with it. Now, we can bring our favorite movie DVDs without onboard and keep our family entertained. You only have to use one remote control for the TV and DVD player. This unit also comes with a USB port. And with it, we can watch slideshows or listen to music whenever we want. Just simply plugging a flash drive into the port will do the trick. On the downside, this RV TV might not be for those looking for a better picture quality. When shopping around for televisions for RV’s, you shouldn’t miss this one from AXESS. I am impressed with the excellent picture quality and design of this travel trailer TV for its price. 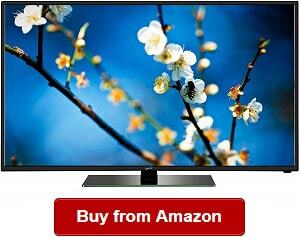 It is a LED TV model that offers high quality viewing experience. You also have several options in using it because it already comes with different ports for your entertainment needs. A few of these include USB, HDMI and VGA inputs. It has a 24-inch widescreen that offers superb viewing experience for the whole family. I also love the high definition color balance that gives life to the moving and still subjects and objects on the screen. The vivid color and superb picture performance makes this one a great choice for trailers and campers. I also love the build-in DVD player because we don’t need to spend on a separate device to have another entertainment option onboard. Another reason I recommend this TV is its 1920×1080 Full HD Resolution, offering quality picture performance that makes this model a standout versus other units out there. It also allows getting our media in one place because of its wide range of inputs. With it, we will never run out of choices on the kind of media we want to watch and listen to in this unit. With all its great features and benefits, this unit is one of the highly recommended RV TVs. We can also have peace of mind of its durability, as it is by a top brand committed to performance and quality of their products. However, I just thought that its sound quality could be improved. 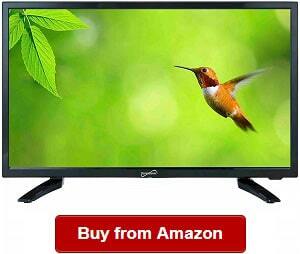 SuperSonic HDTV is the best TV for RV use for its excellent sound and picture quality. It is a great RV TV that offers super sound quality for the total entertainment of the family. I also love that it is one of the most affordable for its value on the market. I like that it has a cool and updated design that suits any recreational vehicle decoration and theme. It also offers nice viewing experience when watching all the shows and movies you love while traveling in your trailer or RV. I also recommend it because of its ability of receiving great signal. With it, you and your loved ones can watch all the shows you love anytime without any hassles. Another thing notable about this TV is that it comes with nice audio speakers that let us improve our viewing experience with the clear sound it can produce. The SuperSonic 1080p TV comes with nice controls that will let you make quick and easy adjustments to the sounds and other settings. The size is also just right, so it won’t take up much space. It also offers liquid crystal technology, one thing making it unique and highly innovative. This unit can deliver us with clear views, which can improve our viewing experience. You can also rely on the unit that offers us with smooth motion when watching shows and movies. It also has a scan capability of 1080p. Using only a single cable, we can enjoy watching TV shows with the included HDMI port. Another thing I love about it is it comes with noise reduction that minimizes noise and interference. You can also play media from your flash drive with the included USB port of the TV. On the downside, it can have some static times. Never run out of media options by choosing the Class LED Media Player Package. You can rely on it for RV TVs electronics because of its performance and picture quality that offers vivid motion technology. 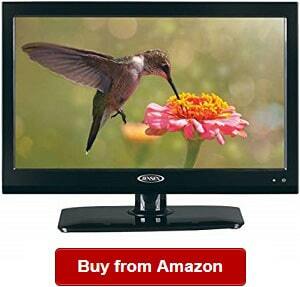 I also recommend this TV because it is a combo or media player or DVD player and LED TV. That said we wouldn’t run out of media options when it comes to entertainment that our family would appreciate when traveling with the camper or travel trailer. Whether it is music, movies and photo files you want, you can play and view/listen to any of them because this unit is a complete car package. I also appreciate that it can play digital media from SD cards and USB drives. This unit is also wall mountable, so it can be space saving, too. You won’t even notice that it’s there. You can easily mount it without any hassle. You just have to find one of the suitable RV flat screen TV mounts. The complete TV package also comes with a TV stand. That said, you also have the option of not wall mounting it. It is also designed with different adapters, including an L-shaped coaxial adapter and DC car adapter. The unit is suitable form mounting in the truck, car or camper. In that case, you can be certain that you will have entertainment wherever you are. Other accessories included are PC VGA, antenna, component, HDMI and audio inputs that have headphone outputs and coaxial digital audio outputs. It has quite a smaller display versus others on the market do. 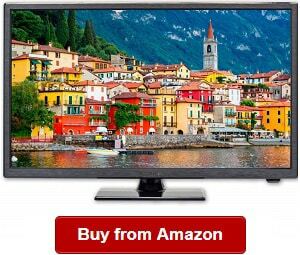 Reading 12 volt TV DVD combo reviews, you might have bumped into the unit that is a great combination of a media package suitable for campers, travel trailers, campers and other mobile homes. The Proscan PLEDV2488A-E has a bigger screen display of 24 inches, which makes a better viewing experience. 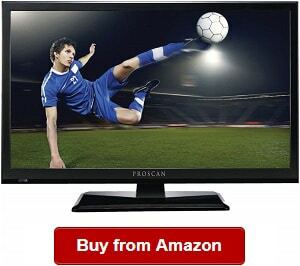 I also recommend this TV because it is a combination of a LED TV and a DVD player. So having a media player, you don’t have to buy a separate one. With its DVD functionality, you can also enjoy watching your top pick movies anytime while onboard the RV. Definitely, it is the ideal accompaniment for your vehicle. You can also depend on its versatility because it can let you use it as a computer monitor for its VGA port. The unit is also great for any room because it has just the right size. I also love its elegant and classic design that suits any recreational vehicle theme or decoration. It also offers superb picture quality that you will love when watching your favorite shows and movies. I also love that flat panel screen of this recreational vehicle TV that makes it elegant. This flat screen is also wall mountable, so you can simply have it on the wall to save space. But then, you also have the option of using its stand if you don’t want to wall mount it. It also comes with a full functioning remote control that will let you watch and enjoy it right away. You can also connect this TV to any device because of the different connections included. Overall, this Proscan model is one of the best trailer TVs on the market that you should not miss when trying to compare your options. On a negative note, it has no smart functionality. The Jensen RV TV is one of the most innovative TVs for recreational vehicles because it is HD ready. One of the things I like about it is its sleek and modern appearance and design. It also has a robust chassis versus other RV TVs on the market now. It has a unique design that makes it a standout among other options. But then, it is not only its aesthetic appeal that I love about it. This unit also has an industrial-grade metal cabinet, which is reinforced for vibration. That said, you don’t have to worry about it being damaged due to any vibration that it will receive from operation. The TV is also a suitable unit for the RV because of its true 12 V operation. It is a standard in the industry and is also common for travel trailers. This unit is also superb for its vivid and clear picture quality. I would also like to recommend it because of its full function remote control that lets you take full charge of your viewing experience. This HD ready TV also comes with a mounting pattern, so you won’t have a hard time in case you decide to mount it. Overall, the Jensen JTV19DC is one of the best value TVs for over-the-road use. You can rely on its great performance, superb picture quality and crisp sound. It has the features and benefits you will be looking for a great recreational vehicle TV. This might not be for those looking for a bigger screen display size. 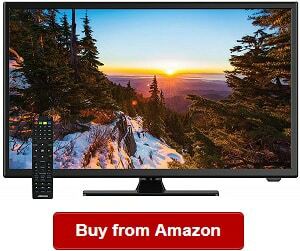 When shopping around for a mobile home TV, you should look for one that does not require buying other RV TV accessories. It must be a complete package that lets you enjoy your RV right out of the box. One of those I found to possess this feature is the SuperSonic 1080p LED Widescreen HDTV. For one, it comes complete with HDMI inputs that can improve your sound and TV watching experience with just a single cable. I also love that it has noise reduction performance, limiting any noise interference that the TV will receive. So with noise reduction, you can be certain that you can get crisp sound. The SuperSonic also comes with a built-in DVD player, which lets you enjoy your favorite movies anytime and anywhere. You can also look forward to more entertainment for your kids and the entire family. It also has an SD compatible input that lets you play your favorite songs or watch your movies from an SD card. That’s not all, though. The travel trailer TV also comes with a USB input that lets you enjoy your media files from the USB flash drive on it. It also offers color balance, which improves our viewing experience. With it, you can certain that those moving images on the screen will be brought to life with the excellent color balance of this TV. Overall, it is a decent choice for its price and features. This is also a complete media package that won’t require you to buy any other accessories. You can also use it out of the box with the full functioning and easy to use remote control. However, this unit might not be that best one when it comes to sound performance. The 12 volt TV for RV is one of the best in its class because of its ability of delivering stunning audio and video while we’re traveling with our recreational vehicle. You can also have peace of mind that the Sceptre E195BD-SRR. It is a good choice if you’re looking for excellent picture quality. This unit is also superb in providing you with high definition. It also has tons of colors for a balance of full spectrum colors and 720P resolution that provide excellent visuals. You will probably be impressed with the nice feature that makes the Sceptre E195BD-SRR a top choice. Using just one HDMI port, you can connect different devices to the LED high definition TV. With it, the options are endless when it comes to media playing. You can also stream your favorite shows and movies online by simply connecting your device to the port. It also comes with a built-in DVD player, which is ready out of the box with only a few clicks on the remote control. This TV also has a nice-looking brush finish on its surface, making it look elegant and classic to use for any RV decoration. It also gives the TV protection from any scratches, keeping it looking new. This brush-finish is also good to the touch. If you’re looking for performance and design for a new recreational vehicle, you might not have to look any further if you have the Sceptre E195BD-SRR. It is your perfect entertainment companion that lets you watch your favorite shows and movies onboard. However, it might not be for those looking for a bigger screen display TV. 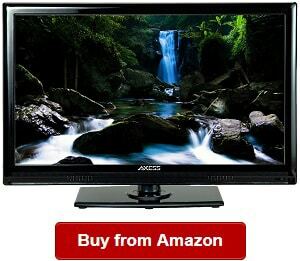 The 24-Inch TV from AXESS is one of my favorite TVs around for an RV because of its excellent features and advantages offered. 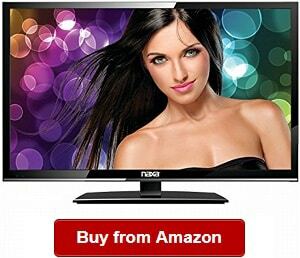 For one, it is a LED TV that is guaranteed to offer great picture quality. This complete media package also comes with a car cord technology. 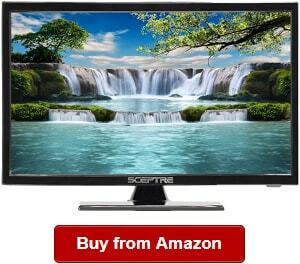 It is a real 12V TV that is a standard for recreational vehicle, mobile home and camper TVs. When it comes to entertainment, you will also not run out of options because it also includes a built-in DVD player. And with it, you don’t need to buy a separate DVD player to watch your favorite movies. Another thing I love about this unit is its HDMI port that allows connecting any device on it. With such feature, you can watch slideshows from your phone as well as play music and other types of media file only in one TV unit. You can also rely on the versatile TV that offers different inputs, such as USB. With that, you can plug your flash drive to view photos from it on your AXESS TVD. It also has a VGA input that lets you use it as a PC monitor. With plenty of options, it is like buying different devices for the price of one. This product also has a full function remote control that lets you take control of your viewing experience with simple and easy adjustments on the settings, including the color and brightness. I also love its sleek and elegant design that complements any room, whether or not you choose to mount it. 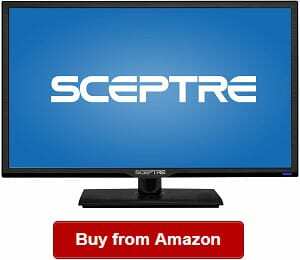 Overall, the 1080p LED HDTV is a decent choice when looking for a travel trailer TVs because it has different input options and built-in remote control along with other great features. On the downside, it might not possess the best sound quality. This E249BD-FMQC MHL Ready TV and DVD combo is another great option when it comes to camper or travel trailer TVs because of its robust build, excellent features and outstanding picture quality. It has a real metal black color that makes it a great addition to any room. It can match any room decoration and theme. This unit is also one of my favorite 12 volt RV TV DVD combo because of its MHL feature that can let you transfer your media files from your device onto the flat TV. This TV also gives you options in setting it up. If you choose to mount it on the wall, you can also install it easily because it is VESA wall mount ready. You can also choose not to mount it because it comes with a TV stand. The unit also has a USB input that lets you connect your USB device onto the port in order to view your pictures or listen to music. All you have to do is to insert the flash drive into the port. This E249BD-FMQC can also deliver you lifelike visuals and radiant colors for your superb viewing experience. You can also reduce any cable clutter with it because you only need to connect one cable to the display. This model also comes with an HDMI input for delivering you an excellent audio and video performance. You can also rely on this unit because it lets you take advantage of viewing or streaming your media, including movies, on your phone and tablet on the TV. It is one of the smart functions of this model that makes it a top contender when it comes to the best RV TVs on the market. On the downside, it is a bit pricey, though. You should trust us when choosing a 12 volt smart TV because we have carefully selected the best products in the category. We have also taken the time to research, compare and review their best functions and features. Our team also read many reviews, such as Jensen TV reviews to figure out what makes great televisions great for RV use. 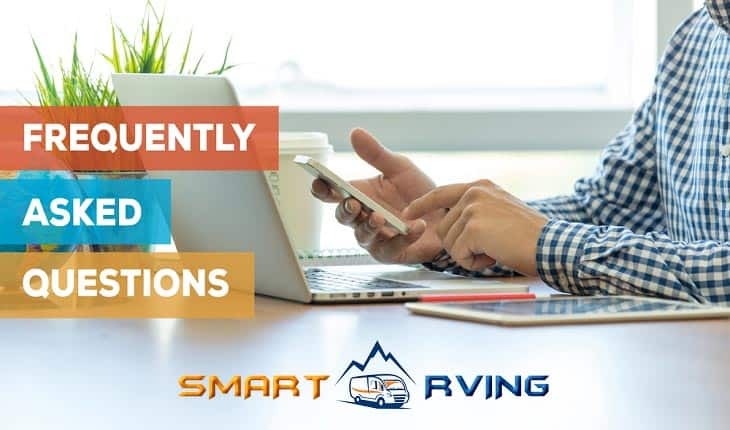 Smart RVing also envisions to becoming the top online source of info for RV product guides to help our fellow RVers buy the right RV TV, accessories and other things for their recreational vehicles. We have also carefully picked based on the features we deemed important, including size, mounting option, and type and other things that must be looked into when shopping around. The RV smart TV is a television set especially designed, engineered and built for over-the-road operation and use. It has special features that can deal with constant movement and vibration inside the vehicle. It also works pretty much like our home TVs only except many of them work with 12 volts. It is a compact and smaller recreational vehicle TV that works ideally for most RVs and travel trailers. This TV does not occupy too much space. It has the same functions and technology of the larger units in general. It is a larger option if you want a larger viewing screen. If you have a relatively enough space available to mount or install it in your vehicle, you might as well choose this size for your camper. Don’t let boredom take over when camping aboard your vehicle. While camping is a pleasurable activity, many of us still want some other forms of entertainment while not reaching the camping ground. That is why it pays off to find a good RV TV that works for mobile homes and can offer us a superb viewing experience for our favorite TV shows and movies. 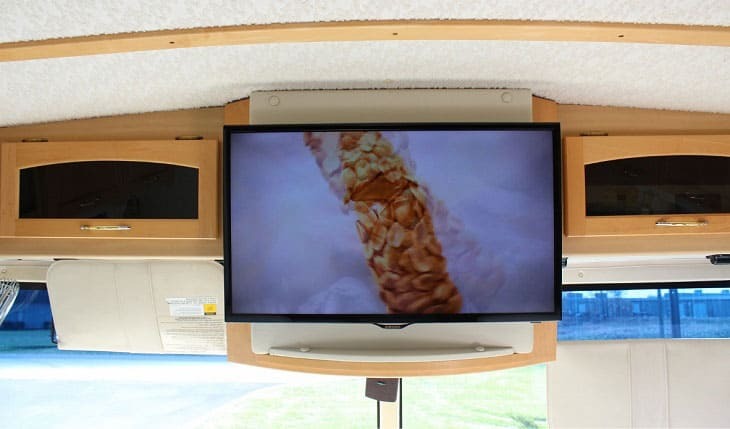 The best camper televisions also have plenty of input options, such as SD and USB. Both of these let us just insert the card or the flash drive, and then view our photos or listen to music on our TV. We can also listen to music and watch movies from our devices, including tablets to the RV TV because the best among them also have HDMI port. This port also gets rid of the clutter of having too many cables to use in viewing our media files. With this option, we can also watch movies from the internet from our device to our TV. With the RV television, we don’t have to bring our bulky TV at home. And of course, it is not designed and built for dealing with the jostling and bouncing of moving vehicles. Mobile home TVs are also convenient to use because they have full functioning remote controls that let us adjust the settings or play the DVD player using one remote control. We also don’t run out of options when it comes to media playing because the unit comes with different input options that we can easily choose from and use anytime. With plenty of media playing options, we can keep ourselves and our family members entertained while traveling with the recreational vehicle. The camper TV is designed, engineered and built for moving vehicles. It is designed to withstand vibration and jostling. It is ideal for use in motor homes because it has features positioned to keep it functioning even with constant movement. For example is a robust metal cabinet that prevents vibration. They don’t require a generator to work, but they can work on batteries. They are ideal for you if you don’t have a generator. Choose one of the 12V TVs we have featured and reviewed earlier. 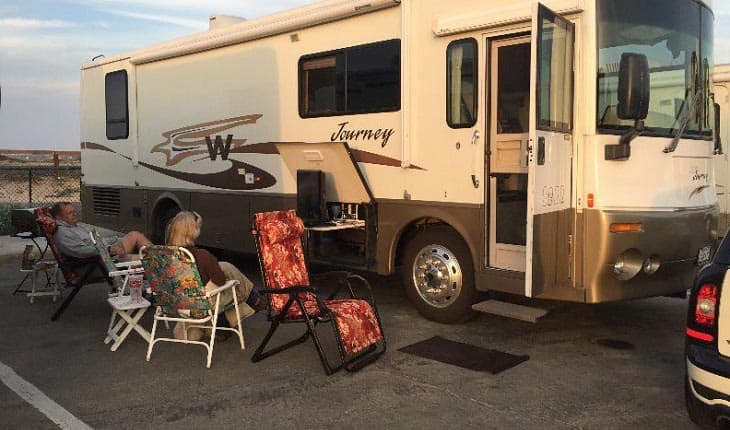 Selecting a recreational vehicle TV is not easy if you don’t know what to look for, and in fact, it can take too much time when you cannot narrow your options. In the following, we’re sharing some factors we’ve used in determining what to look for the best camper or travel trailer TV that you can count on for anytime and anywhere entertainment. You cannot just put a home TV in your vehicle even if you may want to use it. A home TV is not designed and built for over-the-road use and operation. It is not meant for the vibration, bumping and jostling due to the movement of your trailer or RV. You cannot expect it to work for a moving vehicle. That is why you have to pick the television meant for recreational vehicle use. Remember that the best recreational televisions are those that can withstand the movement and vibration, and a few top brands include Jensen and those we listed in reviews. You also have to find one that can handle weather and temperature changes as well as humidity levels. 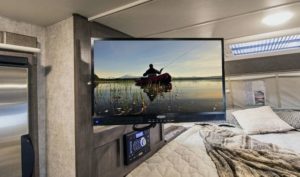 Many types of RV TVs are also now more innovative because they have flat and antiglare screens, which make them ideal even for watching during the day. 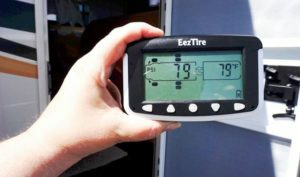 Aside from knowing the best TV size for RV, you should also check the voltage of the RV you’re picking. A standard in the RV world is the 12V models. It is the type convenient for use in the camper, mobile home or travel trailer. You should remember this as one of the most important factors when choosing a TV for your vehicle. Although you can buy many adapters, you still might want to buy the right TV that fits your kind of setup in the vehicle. You also don’t want too many cable clutters, so you might as well pick those that can let you operate with an HDMI, allowing connecting of different devices using one cable. Usually, the size of many recreational vehicle TVs ranges from 19 to 24 inches. They are not really as big as those we can see in homes. They are more compact and robust in built to ensure that they could deal with constant movement and vibration of a moving RV. But regarding picking the right size, you should also consider the available space in your vehicle. Determine the space’s size where you can position the TV, which should not consume too much of it. 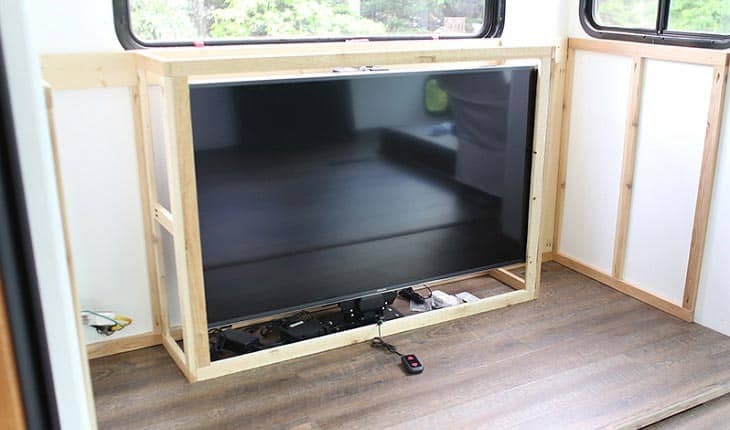 If you have a very limited space, there are also smaller sized RV TVs available on the market, but know that they also have limited screen size that might interfere with your viewing experience. 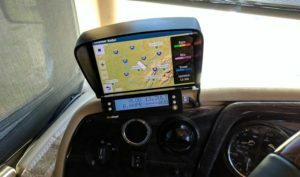 LCDs are also ideal options when it comes to recreational vehicle TVs because they have a slimmer profile. They can also deal with bouncing quite well. However, if the space is really a concern, you might as well pick a portable TV set, which size can only be a few inches. Speaking of space, campers and travel trailers have a limited space, so it makes sense to find a TV that allows options in installation. The best ones are wall mounting ready, so you can easily install them on the interior wall. You also have the option of just using the TV stand that comes with your unit. Nevertheless, you should determine the mounting option available to know what you really need. The common one is 12V power TVs, and again, this is a standard. On the other hand, there are also models, which can make use of a conventional AC or DC power, and others are using an AC adaptor. But then, there are also models suitable for many types of power. In all cases, you should know the power source to use and choose one that suits your situation well. Alternatively, you can choose a 12V TV that can make use of batteries for a power source if you don’t have a generator. You should choose a multifunctional media package for your smart TV, meaning it can have other functions. For example, you might as well pick those that come with a DVD player. In this case, you don’t have to buy a player for your RV to watch your favorite movies. On the other hand, you can also choose a TV that comes with other features and functions so that you will have plenty of entertainment options. If possible, you should pick a TV designed and built to pick or receive over-the-air TV. On the other hand, many RV owners still want to add satellite TV on their travel trailer. 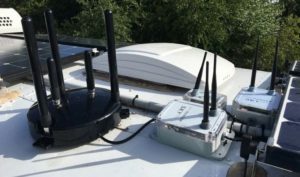 Some of them also use an outside antenna to pick better reception. For the best results, I also think that choosing satellite TV packages are perfect when it comes to reception. They can support some popular services, such as Direct TV or Dish Network. Now if you want to watch your favorite shows regularly, I suggest subscribing to a TV service. Or, you can also buy a dome antenna that can pick up many signals. However, choose one that can work even when you’re on the go. There you have some of the things we have looked into when looking for the best recreational TVs to select for your motor home. Again, think of the TV size, available RV space, mounting option, power and reception, among others we have listed. Refer to this guide and compare the TVs we’ve reviewed. 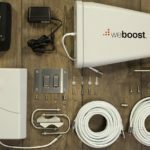 Q: Should you buy RV TV wall mount? A: Yes, you should buy an RV TV wall mount like the Mounting Dream that suits many sizes ranging from 17 and 39 inches. It also works well for many types of vehicles, including marine boats, truck, trailer, camper and motor home, to name some. Nevertheless, a wall mount an help you mount the TV easily in your RV. Q: RV TV vs. regular TV: What is the Difference? A: There are many things that make the regular TV and RV TV different. A few of them include the power source requirement, voltage, size and compatibility for recreational vehicle use. If you want to have a television package for your camper or vehicle, you should not use a regular TV because it is not suitable for constant movement and vibration in the RV. 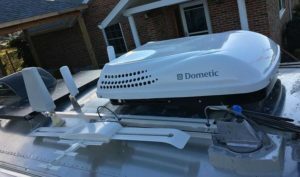 Q: How to get satellite TV for RV? A: You can get a satellite TV for your recreational vehicle by subscribing to satellite services, such as DirectTV or Dish Network. You can compare and weigh your option if you really want to have better channels on your RV with satellite TV. You must also choose a satellite TV package suitable for receiving satellite signals. Q: What are good RV TV brands? A: There are many of them around and thanks to technology that they are getting better all the time. Some of the best brands to choose from and buy a unit from are NAXA, SuperSonic, AXESS, Sceptre, Proscan and Jensen. Q: Who makes Jensen TV? A: According to a source, Dual Electronics Corporation owns Jensen TV. 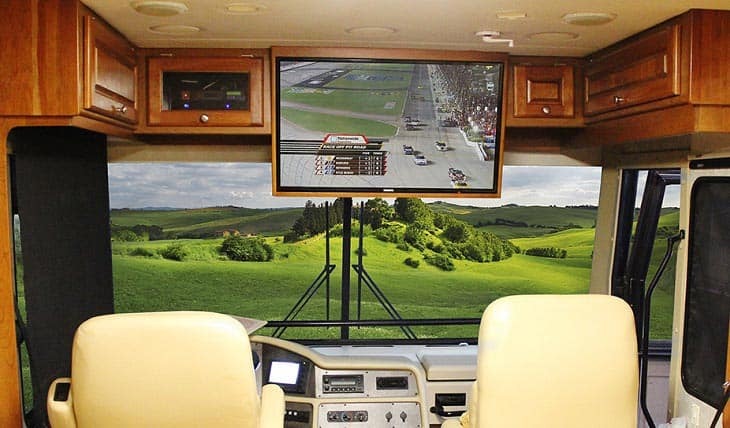 Jensen is one of the pioneers in recreational vehicle televisions, and since then has always remained consistent in supplying the RV world with top quality and innovative recreational vehicle televisions and accessories. There you have our guide on how to choose the best TV for RV. Definitely, the process can be easier if you know what you’re looking for, including its size, mounting option and functions, among other things that can make your viewing experience better. Nevertheless, you can start comparing your choices based on the list of the top picks we have highlighted in today’s guide. 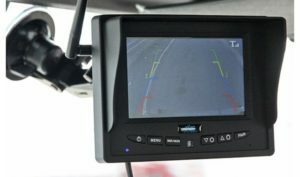 Are you looking for best RV backup cameras, best TV antennas for RV, best WiFi boosters for RV, best cell phone boosters for RV, best RV GPS and best RV tire pressure monitoring systems in RV Electronics. We do hope you find them useful!